This is no philosophical post. I got two blogger awards recently and I'm happily typing away to glory! I'm pretty sure if you peer into the screen too closely, you might just be able to have a glimpse of the zeal I'm currently possessed with! 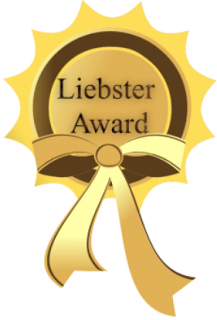 Thank you dear Ruya Preetika (Waking Moments) for awarding me The Liebster Award, and Srishti (My Take) for bestowing my blog with the Creative Blogger Award! (Those attempts at Fiction and poetry did make an impact, yay!). Ruya asked 11 interesting questions. 1. Other than writing, what is the one thing/activity in life you can't live without? Super simple! I-can-not-live-without-reading. If I weren't human and we lived in a world where you survived based on doing one thing that makes you live, I'd survive only through reading. I have always been fascinated with the written word. Always. It's just such an effective cure for everything, too! 2. If there was a complaint box where you could drop in complaints regarding your life, what would you complain about and why? You know, I've always been a cribber. One incident a couple of years ago made me see how wrong it is to complain, all the freaking time. No, nothing happened. I just stumbled upon a conversation between two people in my extended family, something about how I'll only complain, just like I always do, about everything. That actually hurt, specially because I never thought about what I was doing, and hearing about it from someone I'm close to, that too in a way that absolutely meant how much they disliked it, was kind of shocking. Since then, I'm conscious about what I speak. Before uttering anything that's negative, I check myself and either don't say it, or say something else that's in a positive sense. I'm sort of glad I came to know and I realized how deep the problem was. I still think of something to complain about while making a conversation, but now I'm able to mentally correct myself and not repeat those things. :) It's made me think of all the good and awesome things and people I have in my life and I'm quite happy about it! :D No complaints what-so-ever! 3. Share a quote/movie/song/book that always inspires you. The book(s) that have had the most impact on me have been the Harry Potter books. They seem to have almost all kinds of lessons in them. I actually think back to those characters and quotes (mostly by Dumbledore), sometimes in a relatable situation and sometimes just randomly! :P Undeniably, I feel inspired by quotes from the books, one of my favorites being, "It is our choices that show us who we really are, far more than our abilities". It's all about what you choose to do, it's what matters and it speaks volumes about your character. I think back to this and try making the right kind of choices. Also, I'm heavily influenced by JKR's speech, the one she gave at Harvard University. She talked about two things: failure and imagination. The lines that I found best (and those that I've memorized quite well, along with a lot many lines from that speech :P) are: "It is impossible to live without failing at something, unless you live so cautiously that you might as well have not lived at all, in which case you fail by default." Not just one, it's all those times I did something special with my family. Anything, all those times when I felt that unique sense of amazing happiness, the kind where you can literally feel your heart lighten up and you feel giddy. Our family of five did a lot of fun stuff when I was a kid, mostly initiated by dad and I treasure each one of them! ^_^ Also, weird as it may sound, I quite like to remember the time I got lost while coming back with my tiny brother and grandmom from a park a few blocks away from home. Yes, it must have been terrifying for the 4 (or maybe 5) year old me (as I clearly remember crying while walking on the road. Poor me!) but I like to see it as an incident that proves how awesome I was. I was (still am) quite rebellious and I didn't listen to my grandmom, calling out to her that I'll find my way on my own. Born Don! Of course I panicked when I saw a dead-end instead of the right road (and the only one I was familiar with). Not finding my grandmom anywhere, I tried to think of ways and it's a long story. I just know that while walking (and crying, of course) I finally found some familiarity and ran back home. Geez, I have always been sense-of-direction-challenged! 5. Name a fictional character you would like to switch lives with and why? Oooh I know! At the cost of sounding too much HP, I'll still say I would swap with Hermione Granger anytime! She's all that I wish I could be. Okay, maybe not, because I just want to be me, but still. You have to admit, she's quite amazing. :D And she's a witch. Hee hee hee! 6. What brightens your mood when you're angry or dejected? 7. Do you think compromises and adjustments are necessary for relationships to work? Why or why not? Yes, definitely. I don't suppose there's anyone who can live with a situation where they're the only ones who're making adjustments. It has to be there and it has to be mutual. But I also believe that it should be up to a limit. You cannot expect the other person to do something for you by compromising with their comfort level. You shouldn't even want that, actually. It's mean. 8. Given a chance to relive one day of your life, which one would it be and why? 9. What's your idea of fun? 10. What's the qualification for being your perfect guy? 11. If you were given a chance to take revenge on someone, who would they be and how would you do it? I read it already but I'm commenting now!! Congrats on the other award and hope you win many more!! Loved reading your answers....cheers to many more!